Click Here To See Action Comics #856 Comic Book! 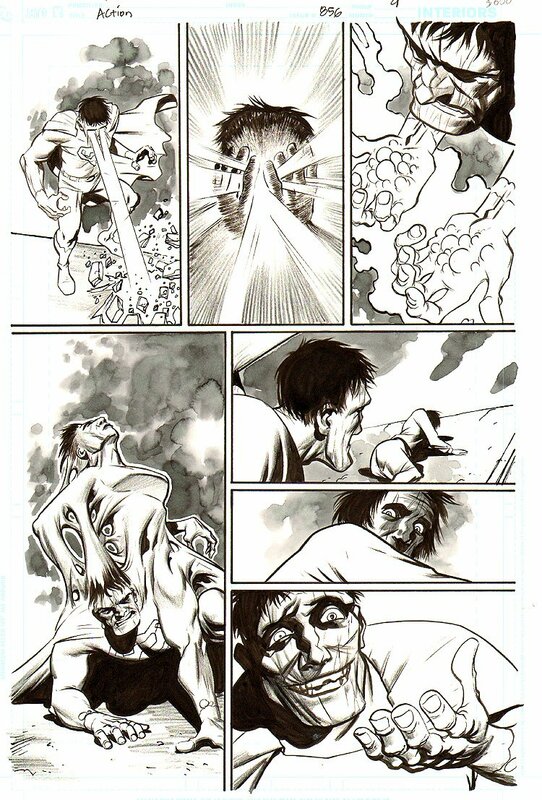 Check out this very cool 2007 SUPERMAN page which was penciled and inked by the great Eric Powell, from the story titled: "Escape from Bizarro World Chapter Two!" Eric Powell only drew "3" issues of SUPERMAN for DC Comics, with a CLASSIC 3 part BIZARRO storyline this page is from! Don't miss out on a GREAT opportunity to get a great page from a great artist drawing the most recognized super hero EVER! In this story, Bizarro flashes back to his original time on Earth. He pushed a little girl from a building, but Superman rescued her. Superman confronted him, and told him that they are not the same. Bizarro fled into space, and decided to build his own planet. After building a cubic world under a blue son, he found it unpopulated. But the blue son gave him vision power to create new duplicates, starting with a Lois Lane bizarro, but she was afraid of him. Back in the present, the bizarros on the Bizarro World want to find Superman, and turn to their Luthor. Meanwhile in the bizarro fortress, Bizarro Superman is trying to get advice from the kidnapped Jonathan Kent, similar to how Superman gets advice from the Jor-El hologram. Superman awakens, but is held in check by several other bizarros. Just then, bizarro Luthor arrives with their secret weapon: bizarro Doomsday. It attacks the bizarros, while Superman rescues his father and they escape outside. They are followed, and as Superman is about to fight this Doomsday, a bizarro Justice League arrives.